Create campaigns to be sent automatically, according to a predetermined schedule. For example, a personal campaign sent to recipients on their birthday. Everyone loves celebrating special events such as birthdays and anniversaries, taking every chance they get to deviate from the norm and have some fun. Such events are a great opportunity for any business to show its customers that it cares about them and establish a more personal connection. Use these special events to send your clients Happy Birthday wishes, a one-time benefit or a present in the form of a coupon or discount. ActiveTrail’s email campaign system allows you to use special events to connect with your clients without having to lift a finger. Just create an automatic birthday campaign and within minutes you’ll have all your recipients’ birthdays covered. Birthdays and special events are not just opportunities for you to send cards and wishes to your clients, but can also be used in a more practical sense by sending out special offers that are relevant to specific dates. .Send an offer for a luxurious hotel one month before a couple is celebrating their anniversary to give them time to book the vacation in advance. Selling clothes? Send coupons marketing your products a few days before a client’s birthday so she can enjoy her new dress on the day of her birthday. 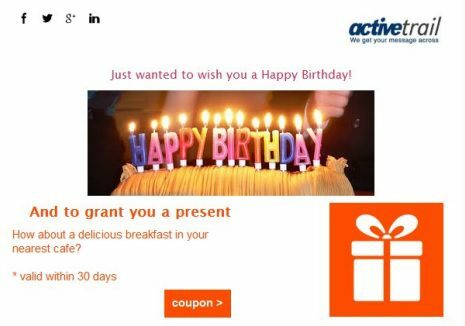 Using ActiveTrail’s system you can always follow up on your birthday campaign to find out how many emails were left unopened and the overall success rates of your campaigns. Send out another email to customers who haven’t opened your first email to remind them that there is a coupon waiting for them and give them another chance to make their birthday or anniversary more special. Using ActiveTrail’s stylish templates you can send a gorgeous and cheerful birthday campaign within minutes. Just pick one of the ready templates and add your personal colors and logo to make it your own. Make the campaign personal by opening the email with a personal greeting using the customer’s name, or any other personal detail that the system possesses. Don’t know your customer’s birthday? Just ask! Whether you just want to send your customers greetings for their birthdays or you want to take advantage of such events to boost your sales, send out an email to your recipients requesting additional information. Use these dates and other information to boost the connection between the business and its customers. What are you waiting for? Create your first birthday campaign to make your customers feel special, at least one day a year.